Forget about "the year of the rat" for a minute, let's focus on the potato. About a year ago, He spotted a potato sprouting happily in the kitchen vegetable basket. The next I knew, the tatty had disappeared, buried in the garden. We forgot all about it: He, forgot where exactly he had buried it and me, I did not have anything to forget really, but I did. Soon something grew, it grew and grew, so tall that I really thought it was going to reach the sky and produce beans. We kept asking people "What does a potato plant looks like?" "does it look like this?" opinions varied. Then, Ann and Barbara came over for the "digging ceremony" which involved a pound, a bet: winner takes all. Lots of arguments later, at his great amazement 8 spuds were unearthed. The story does not end here. 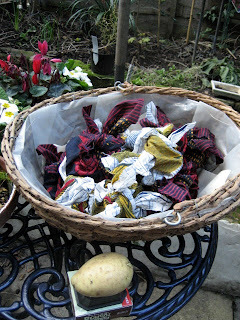 The idea germinated, Ann and Barbara wanted to do it again, before I knew what was happening we were having a party, rules were distributed to friends and neighbours: plant a potato, bet a pound, and when the time comes we will have another party involving digging, arguments and a couple of winners. The Potato contest was born. Amazingly, a little later, the U.N. yes that very one: the United Nations were doing something very similar. I wonder where they got their idea from? they called it the International Year of the Potato. Very kindly, in doing so, they have saved me a lot of typing and their research is impeccable, the growing your own page will be very useful to the contestants. Now I just need to take my basket full of seeds, wrapped in African batik for the occasion, around the houses for the long awaited distribution. Finding ways to brighten up winter days is a challenge but any thing which give me the opportunity to do a little mischief can't be bad. Usually, I plague everybody with tales of looking everywhere for the elusive Seville oranges only available a for a few weeks in January. But this year, he made a bee line for the Waitrose stall and a kilo of bright orange small globes were deposited on the table. So with the sound of "lady marmalade, voulez vous coucher avec moi ce soir" in my head....and it will remain there as I could not find a free download, I liked, for you. I started pitting and chopping finally, the tip here is to allow yourself time, a lot of time. Cut 2lbs of oranges into halves, remove the pips, saving any juice and slice finely. Put it all in a saucepan and simmer slowly as you work away, it does not seem to matter if some oranges simmer for longer than others. Add 3 lbs of sugar, pre-warmed in a tray in the oven. 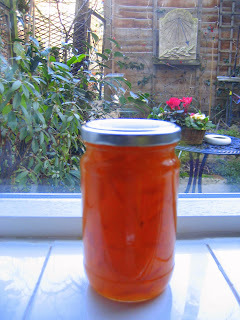 The marmalade should be then boiled rapidly to reduce it to exactly 5lbs in wight or until the mixture sets when a drop is left to cool on a saucer. Take off the heat when the setting point is reached and after 10 minutes it is ready to be put into pots. Though quiches are good. Flans are quicker to prepare and have the distinguished advantage to contain less calorie. This dish is great when there are a lot of people, perfect dish of the moment 'cause let face it, if January is a month for counting calories, the festive spirit has not disappeared yet, and the partying continues. add the bacon and the breacrumbs here the recipe includes the butter but Hoi it is January, remember. finish it off under the grill. If, in 2007, you had started a blog called: “Pebble Soup”, then you should expect to be showered with “soup-presents.” When I dreamt about Christmas, invariably the same nightmare came up: a vision of the big guy in red throwing colourful ladles at me. I almost put a sign on the door saying: Dear Father Christmas, do not bother, I have been naughty all year -long. 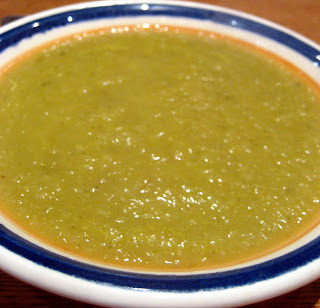 On the fateful night, I frisked all my presents to make sure that there wasn’t any thing “soup-shaped.” To my amazement, only two presents where food-related, moreover only one dedicated to soups. Oh noooo, isn’t anybody reading my blog? 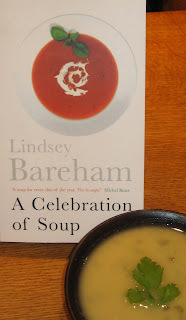 A Celebration of Soup (Cookery Library) is indeed a great present, a classic, a must-have book. With recipes full of E … not the additive E, no, no, no, I am talking about the E for Exciting, Entertaining, Educating. You opened the book to a citation of Lewis Carroll’s: beautiful sooooouuuup, and, from the start you feel confident that you are in good hands here: tips, a troubleshooting guide, tricks of the trade, and more. Everything is covered, from which equipment to have, to what to drink with your soup. Handy notes head the recipes which come from top chefs worldwide, restaurants to cookery writers and anonymous, all sprinkled with the author’s innovation. It was shortlisted for the most cerebral of the foodie award over a decade ago (André Simon’s) and when you get to the bibliography, you understand why: it is extremely well documented. Ah I forgot to say this book contain no pictures, but in this case, it is not a disappointment, plus when was the last time your own dish looked like the glossy picture on display? I know that it is not true but when you look at the index, which by the way indicates v for vegetarian and f for fish, it feels like ALL the soups in the world are there for me to try. So I did, made a start with a quick soup: sopa de panela. 2 x 400g/ 14 oz cans chickpea, 2 fat cloves of garlic roughly chopped, 6 tps olive oil, 2 tbsp lemon juice, salt and pepper, 2 tbsp fresh mint leaves and 2 tbsp of parsley, all leaves finely chopped. Drain the liquid from the chickpea can into a measuring jug and make up the amount to 900ml/ 1 and 1/2 pints. Purée the liquid with the chickpeas, garlic, olive oil and lemon juice and season to tast with salt and pepper. Turn into a pan and stir in most of the mint and parsley. Heat through, taste and adjust the seasoning. Serve garnished with the rest of the mint and parsley and, if liked, a swirl of olive oil, and triangular croutons (for which you also get the recipe too) and lemon wedges on the side. I am not sure what happened, it has got to do with these balls in the air, I do not seem to have been able to keep my eyes on them all. But it is all over, for I have got a new calendar which chimes to tell me when to do what, you will see...what you will see or rather watch this space on Wednesdays and........another day. Just before Xmas, I went to a restaurant in Avignon where this "No name" dish came as a surprise. Is it a lasagna, is it a ravioli, what ever it was, it was delicious. Un-lady like, I started by taking a picture of it, then dissecting it, I tried to do so surreptitiously but I am certain that the other guest at the table noticed. It was for a good cause, try to work the recipe out and here it goes. When at home it really is a dinner for two.